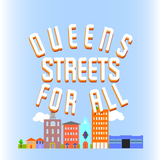 You may receive updates from Queens Streets for All, the sponsor of this petition. You may receive updates from Homer Simpson , the creator of this petition. Restore Skillman & 43rd Avenues before there is a serious injury! There is disaster brewing on Skillman and 43rd Avenues in Sunnyside and Woodside, Queens. The Road Diet and protected bike lanes have failed, and instead of improving life in our neighborhood, they have put us in danger. I urge you to restore the roads to their former design, for everyone’s safety. We are unsafe, and these dangers are unacceptable. Despite six months of efforts to stop the installation of the Road Diet and protected bike lanes on Skillman and 43rd Avenues, the plan moved forward and the problems are even worse than anticipated. The entire community agrees that the DOT changes must be rolled back. Our demand is supported by our Congressman and Assemblywoman, religious & parochial schools, every house of worship, every business, and over 5000 residents. As your constituents, we urge you to act now instead of standing idly by while we wait for tragedy to strike. Please remove DOT changes immediately and completely restore our streets to their former state. We need you to act before the changes cause serious injury or death. Please Remove the Road Re-Design. Watch our Videos of Emergency vehicles being delayed due to road diet! We, the undersigned request that the N.Y.C. Department of Transportion approve the recommendations of the local citizens to restore Skillman and 43rd avenues in Woodside and Sunnyside. The protected bike lane model does not work on these smaller residential streets and is endangering the lives of people depending on speedy first responders; making lives more difficult for the differently abled, and negatively affecting local small businesses. Restore Skillman & 43rd Avenue now before someone is seriously injured!